Posted on Wed, Mar 7, 2012 : 11:36 p.m. 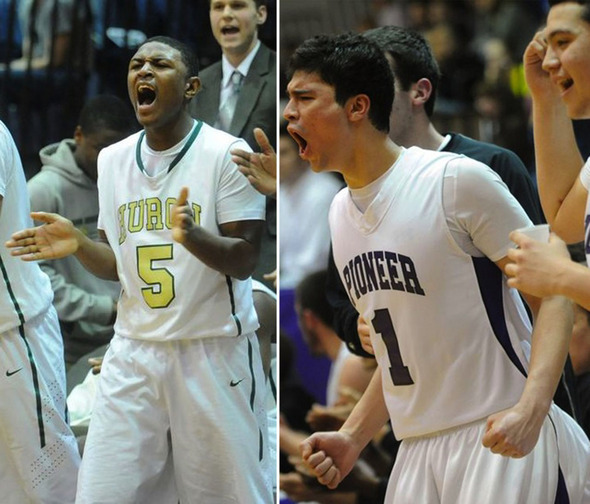 The Pioneer and Huron boys basketball benches erupt during their respective district semifinal win on Wednesday. They will meet in a Class A District championship game. 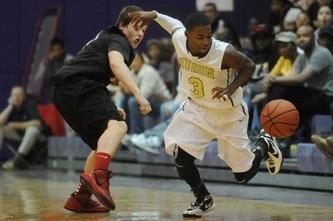 The Pioneer and Huron boys high school boys basketball teams split their regular season series. On Friday, they'll settle the score in a Class A district final at Pioneer High School. Both won district semifinal games on Wednesday, setting up Friday's rubber match. Trailing 18-16 at halftime of the early semifinal against Dexter, Pioneer pulled away in the second half for at 49-35 win as the River Rats watched intently from its seats across from the Pioneer bench. The teams switched places as the Pioneers watched Huron use a 17-0 third quarter run to pull away from Pinckney in a 56-46 victory. Huron beat Pioneer in a one-point contest at the Riverdome back on Jan. 21, while Pioneer won convincingly, 50-34, at Pioneer on Feb. 10. The Pioneers (15-6) didn’t need the presence of their rivals in the gym for them to have nerves. Senior Jimmy Holman admitted to jitters at the beginning of the game, which led to a quarter in which just 12 total points were scored as Dexter took a 7-5 lead. Pioneer's Aedan York, right, beats Dexter's Derek Seidl to a loose ball. Dexter coach Randy Swoverland said after his team’s district quarterfinal victory that the main focus against Pioneer was to contain Holman. He scored just four in the first half as Dexter (10-12) went into the break up 18-16. Near the end of the third quarter, Holman hit two straight pull-up jumpers and things started shifting his way. He opened the third with a put-back after a teammate missed during a fast-break. The play started a 9-0 Pioneer run, which Holman continued with another put-back off of a fastbreak. Dexter wouldn’t bring it back within single digits the rest of the way. By the end, Holman led all scorers with 14 points. Like its rivals, Huron was forced to sweat until the second half. Huron picked up right where it left off from its district quarterfinal: struggling on offense. The River Rats (16-6) fell behind by as many as eight points in the first quarter as they went just 2-for-11 from the field. And after a few turnovers early, Pinckney (12-9) had little trouble with Huron’s press defense. But slowly, Huron calmed down and the pressure started taking over. The River Rats forced turnovers in the second quarter, taking a small lead before going into the half tied 19-19. After four straight points from the Pirates to start the third quarter, enough was enough. Kendall Thomas, right, led Huron with 21 points on the night. Lewis got to the free-throw line. A missed Pinckney shot led two points from Andre Bond the other way. Bond then stole the layup and dished to Kendall Thomas for an easy layup. Thomas came back and hit a three. Lewis with two. Bond with three. Then two more. In two-and-a-half minutes, a four-point deficit turned into a 13-point lead. The team as a whole struggled with the shots off of half court sets, especially in the first half. But Thomas hit just enough to bring Huron out of its rut. He finished with a game-high 21 points while Lewis had 18. Back in the first, Thomas hit a three near the end of the quarter to cut an eight-point lead to five. He never stopped scoring from there. The guard scored 11 straight for Huron in the first half en route to a game-high 21 points. Pinckney’s Kyle Slotnick kept the game within range for the Pirates, scoring 18 points --12 in the second half -- but watched the end of the second half from the bench after fouling out halfway through the fourth quarter.